Here are parts 1 , 2, and 4 of the guide. Here’s some background info, some notes before you begin playing, and my review of the game. The prologue of this part is at first identical to the prologue of the previous chapter. At the end however, they mention how Zelda seeks to translate the tablets and thus is looking to use the Book of Mudora, which currently resides in Link’s home. Agihna and the youth, you, went to Link’s house to find the Book of Mudora. Once you start the game, the youth is sleeping in Link’s house. Once you wake up, Aghina returns your possessions once again with the big bag, warns you to be careful, and tells you to proceed to each of the original 4 dungeons. Open the chest in Link’s house to receive a pair of Worn-Out Gloves. These gloves supposedly can pick up rocks, but you should not use them repeatedly. I did immediately go to the 4 dungeons. At the front of each dungeon, there’s a thief present. The first and 2nd thieves don’t give you anything. On the other hand, the third and fourth thieves gave me big bags. These bags give you the level 2 shield, which can block small projectiles, and the blue mail, which reduces your damage by 1/2. Return to Link’s home using the flute. Go down one screen to enter a large open field. Go to the right of that screen and bomb the cracked wall near the top. 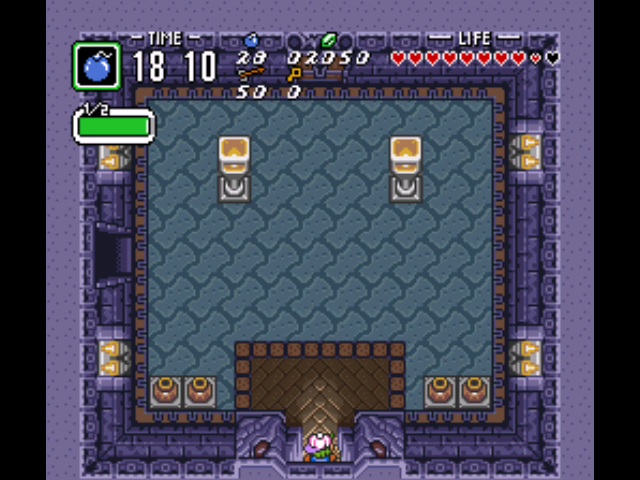 Enter the room and push the blocks in order to receive a Piece of Heart (in the top-left chest) and over 100 rupees. Now go down one screen. At the bottom of this screen, you will see a rock that you can break with the Pegasus Boots. Ram the rock with your Pegasus Boots and enter the stairs that appear beneath it. 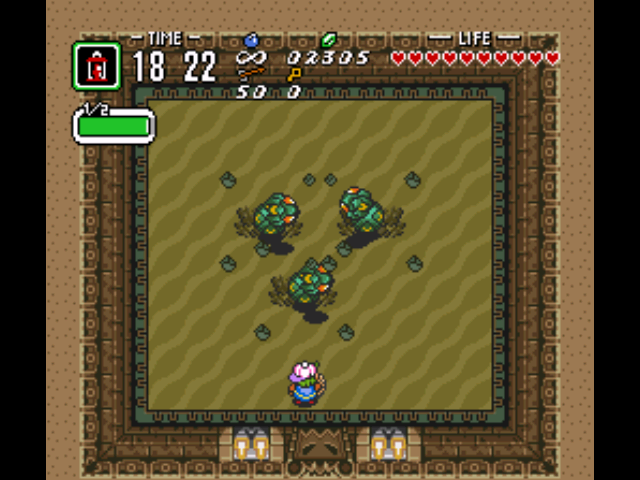 In this cave, bomb the wall at the top, and you’ll receive 100 rupees in the next room. Proceed one screen to the left to see the fifth dungeon. Lift up a small rock, break the larger rock with your Pegasus Boots and proceed inside. The first room of this dungeon clearly has two doors. Since the door at the top is locked, proceed through the left door. In this room, dodge or kill the armored enemy. Next, use your hookshot on the pots in order to get to the other side of a large gap in the middle of the room. Use your hammer on the barrier and proceed forward through the door. In this next room, use your boomerang to obtain the key and open the chest to find the Dungeon Map. Go back to the first room of the dungeon, and now proceed through the locked door with your newly found key. Proceed through this hallway to go downstairs. The next room is a winding path that goes towards the left. In this room are three skeletons and an invincible fire caterpillar that roams around the room. Examine the wall at the bottom for a breakable spot and blast your way through the wall. In this room will be a chest for some rupees and the compass for the dungeon. 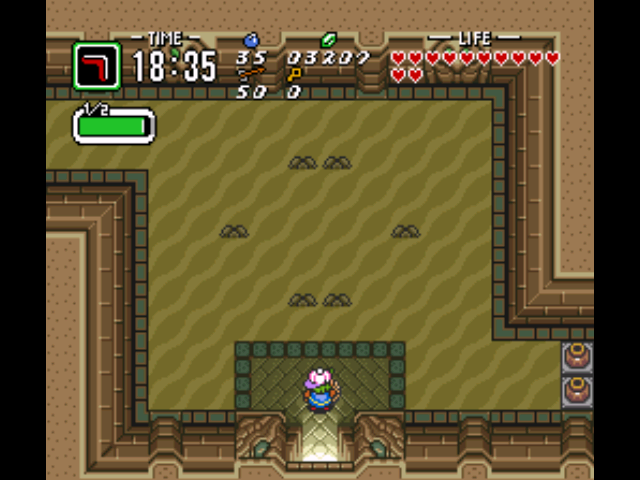 Bomb the wall on the left of this room to receive 100 rupees from a chest. Now return to the winding room from before and proceed to the door on the left. In this next room, there will be another invincible fire caterpillar and four unlit torches surrounded by a series of blocks. Push the blocks and create a path so that you can light the four torches and reach the other side. Quickly light all four torches. This will open the door to your left, which you should quickly go through. Kill the enemies in this next room, and collect the key from the chest. While there is a switch under the pot that opens the door, you can’t keep the switch down while proceeding through the door at this point. As such, proceed to the previous room and go through the top door there. Upstairs, you will be in a room with four Wizrobes. Bomb the wall on the right to find a thief that will give you a bomb upgrade for 200 rupees. Go two rooms to the left and you’ll see a hole surrounded by four blocks. Push the bottom-left block towards the hole and then fall down the hole. Now you can use the block to hold down the switch underneath the pot to open the top door. The next room will have four enemies and a chest. Kill the enemies if you wish and open the chest for a key. In the following room, you’ll find four torches that need to be lit. Light all four torches and a chest will appear on the other side. Use your hookshot to get across, open the chest to find a Big Key, and then go upstairs. In the next room, hit the switch to lower the blue blocks, and open the Big Chest to get the Power Gloves. These Power Gloves allow you to lift rocks normally. Now you’ll notice that orange blocks block your path on your left. Throw a bomb over the fence right next to the switch. Once the bomb explodes, the orange blocks will be lowered. In the next room, turn the switch blue, and proceed to the bottom of the room to open the chest for a key. Next, go to the room on your immediate left. In this room, you’ll see two spiked objects bouncing around and two columns of blocks. Use your boomerang to hit the switch to lower the orange blocks. Now carefully proceed to the other side and then open the chest to receive a key in order to proceed to the next room. In the following room, there will be a large block in the center of the room surrounded by four torches. Light the four torches and go to the next room. Fall down the large hole and proceed to the next room to fight this dungeon’s boss. 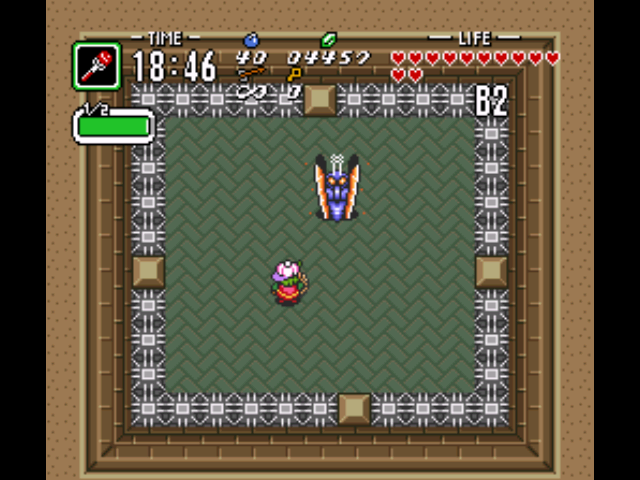 What a surprise, it’s a boss from a Link to the Past again… I will admit I wasn’t expecting this boss so late in the game since it was the second boss in a Link to the Past. The three worm like creatures constantly burrow out from under the ground, fly in the air a bit, and go back underground. When the creatures come out of the ground, four rocks shoot out in diagonal directions. This boss actually takes quite a few hits even with the level 2 sword. Otherwise the boss is the exact same as it was in A Link to the Past. The strategy is just simply to hit the three monsters repeatedly with your sword while dodging the rocks. Using spin attacks may help you defeat the boss quicker. Return to map with Link’s house and go to the right by lifting up the rocks. Then proceed south by lifting up more rocks. Use your hookshot off the ledge in order to reach a piece of heart. Then jump down off the island into the water, swim to the right and climb up a ladder to reach a small island with a cave. Go inside the cave to receive 300 rupees from the character inside. Bomb the wall behind her to find a chest with 300 more rupees. Go to the right side of the lake and save the man drowning in the river by talking to him. He’ll ask you to proceed to the castle. (Ironically now he can swim perfectly fine….) Swim upstream and go under the bridge to receive a bottle from the sleeping man. Go back to the large lake and proceed up the stairs on the right. Now head towards Hyrule Castle and enter the castle. Keeping going straight until you run into Princess Zelda. You’ll find out you saved Zelda’s father? That would make sense, except the fact that the King and Queen of Hyrule are on their throne behind her. So considering he’s the Priest sprite in a Link to the Past, I believe Zelda meant “father” in a religious sense. Well you saved the head priest and you have now been named the Hero of Light! Unfortunately it seems you can’t explore the rest of Hyrule Castle, so exit the castle. However, I guess we should be happy that the Royalty of Hyrule are for once in good health. Return to Link’s house and proceed one screen left, one down, and then another left. You’ll see an open cave blocked off by rocks in this prairie. Enter the cave and use the hookshot to cross a gap towards the top of the cave. The treasure chest will contain a piece of heart. Collect the fairies if you’d like and head outside. Use the flute to head back to the fifth dungeon. Proceed to the left and keep going to the left until you hit the desert. While going towards the desert, break open the large rock with your Pegasus Boots, bomb the cracked wall in the cave and pick up a piece of heart. Now back on the surface, enter the cave on the top left of the screen to get 300 rupees for a thief. There is also a piece of heart in there, but you can’t reach it yet. Now head into the desert. There is a cave on the top right part of the desert. Go inside past the fairies and bomb the wall. Inside the next room, light the four torches to make a chest appear. This contains another heart piece. Now go back outside into the desert and enter the building to reach the sixth dungeon. Go to left in this first room. Going to right just leads you to enemies and a dead end. Open the chest in this room to get the dungeon map and exit the building. Now you will see three entrances on the upper wall. All three of these entrances lead you to different parts of the dungeon. I have instructions on all three entrances. The center entrance has the longest path, has the compass and dungeon map, and has a lot of rupees. 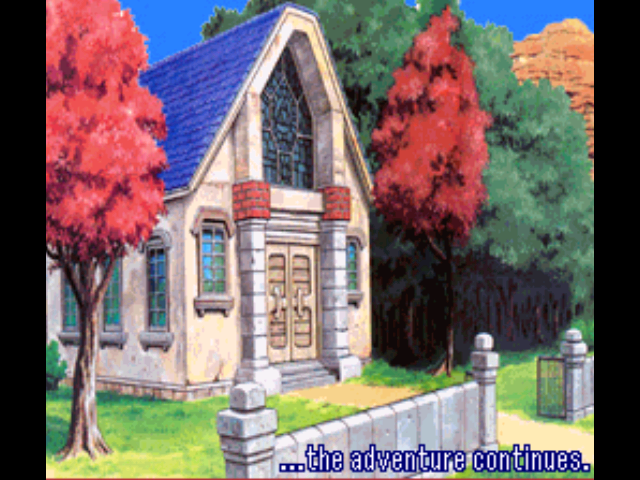 Personally I would take this path out of the three, but the other two paths are great for finishing this castle quickly. I have instructions for each one of the paths below (center, right, and left paths in that order). Go to the center entrance. Proceed through the room and go to the next room through the top-left exit. Navigate through this next room and open the chest before the stairs to get the compass. Pick up the pot in the corner to find a floor switch. Step on the switch to open a door past the stairs. This next room has nothing in it, so go down into the next room. Use your hookshot to get across a gap to two treasure chests. Open these up for rupees, and then drop into the well below. You will enter a room FULL of blue rupees. There are a total of 790 rupees in this room. 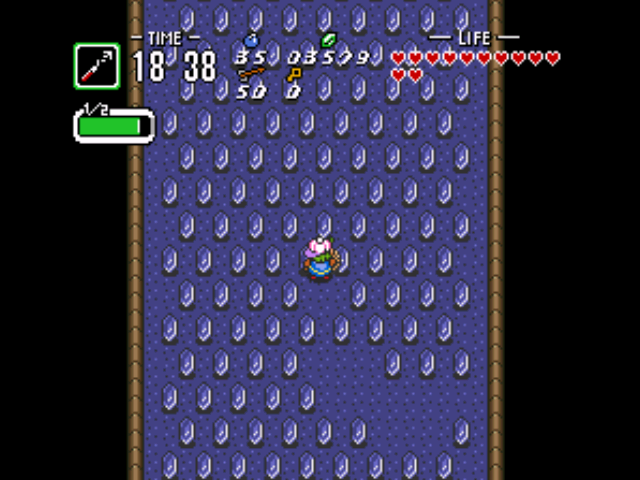 Collect as many rupees as you like and then go to the warp in the top of the room. If you need some fairies, fall into the second well on your right. Otherwise, pick up the pots on the right side to find a key and go into the next room. This room has a set of conveyor belts with a large bouncy object in the middle. Try to navigate to the other side of the room without falling into the abyss. This next room has three shut doors and one on the top. Each of the three entrances follow different paths, but all converge here. Since you went on the center path, lift up the pots to find a switch. Go to the right door and bomb the walls appropriately (look at the map). You’ll find a thief that will give you an arrow upgrade for 200 rupees in the top room. Go back to the room with 4 doors. Read from the “paths converge” section now. Push the left statue on top of the switch to get the door to open. In the next room, throw a bomb from the left side onto the conveyor belt. Quickly throw the bomb so that the switch is hit and the blue blocks are lowered. Next enter a large sandy room with some steps. Turn the switch in the middle of the room red and go up the stairs. Quickly bomb the wall on the right side to get an arrow upgrade for 200 rupees. Go to the left and you’ll reach the room with 4 doors, three of them shut and the top one open. Read from the “Paths Converge” section now. Go past the first room into the second room. Here, kill the enemies until you get a key from one of them. Unlock the door and enter the next room. Here you’ll see four torches, some of which are surrounded by blocks. First, light the torches that you can reach. Immediately throw a bomb over the ledge at the switch. Then quickly light the other two torches to open the door ahead of you. Next, proceed through a long enemy filled corridor with lots of spiked traps. Go through another room with some enemies and enter the door on the right. Here you’ll reach the room with four doors, 3 of which are shut. Lift up a pot and hit the switch to open the three doors. Go through the right door, bomb the right wall in that room, and you can receive an arrow upgrade for 200 rupees. Go back to the room with 4 doors. Now go across the room with 2 Wizrobes and other enemies to go downstairs. Kill the three skeletons in this next room and go through the bottom door. In this next room, go all the way to the bottom of the room. Go up the left stairs to receive the red clothes! These clothes reduce your current damage by 1/2 (if you’re wearing the blue clothes). Now go up the right stairs and through the right door. This next room has a Beamos (laser shooting enemy) on a conveyor belt and the door is shut. Lift up the top-right pot to find the switch and continue. You’ll now enter another room with a Beamos on a set of conveyor belts, and two skeletons. Open the chest in the middle of the room to get the Big Key and exit the room. In the next room, kill all the enemies in the room to get a key. You can kill the skeleton that’s on a far away ledge with a single arrow. Cross the gap in the next room using the hookshot. The following room has the Big Chest, which contains the Fire Rod. The Fire Rod allows you to shoot fire across long distances. It also can be used as an attack. Go into the next room and light the torches using the Fire Rod and the shut door will open. Go through a room with a conveyor belt and two spiked traps, and then fall in the hole of the next room. It’s now time to fight the boss of the Desert Dungeon. This boss behaves exactly as he did in a Link to the Past. Shoot the Fire Rod 3 times at Mothula to kill him as you dodge his projectiles and the moving spikes. If you run out of magic (which is rather hard to do), you can finish him with your sword, although it’s slower this way. Fly back to Link’s house using the flute. Go left one screen and break the large rock on the screen with your Pegasus Boots. Go inside and light all four torches using the Fire Rod. The door will open and a Piece of Heart will be inside. Also, use a flute to return to Kakariko village. Fall into the hole on the upper left side of the village by jumping of a ledge. Inside that cave there will be a piece of heart inside of a chest. That’s all I was able to get after the sixth dungeon. Explore the Light World and you may possibly find something you couldn’t find before. Either way, pass the time until the in-game clock says 18:55 again and a cutscene will start. Get ready for the fourth and final part of the adventure! So it seems like the Book of Mudora was hidden in Link’s house’s basement (there was a basement in that house???). Aghina says that we should hurry to Hyrule Castle and see Princess Zelda. Zelda uses the book to read the stone tablets. The tablets say that there is a hidden power in the mountains called the Silver Arrows. Zelda infers that the “mountain” described is Death Mountain. You, Zelda and Aghina spend the night at the church at the Priest’s request. It seems your quest to Death Mountain will have to wait until the next chapter.